When a strategist, a dental surgeon, a media consultant, a copywriter and a bio-scientist sit down to look back at their campus years, what could result among numerous other things is a book; the only prerequisite being memories that are engrossing enough to move any reader. Ahmed Faiyaz (the strategist), recalls sending a friend home from school with green paint splashed all over him. When enough of such visages popped up in his mind, he was convinced about the captivating prospect of campus tales — some real, others pure fragments of imagination. He then got himself a group of individuals from various walks of life and together they came out with Down the Road — a book of 28 campus tales by 16 authors. And before you could bring it to a close as yet another ‘whatnot- to-do-in-this-college’ book, Ahmed, the editor would like you to know that “There is no stereotype in this collection, and a book like this one has never hit stands in India before.” “The writers include a dentist, a bio-technologist, software engineers, a senior HR executive, a former Miss India contestant, a brand manager, journalism students, a copywriter, a screenplay writer and a housewife,” he lists out. “Most other campus tales you see are essentially love stories set on campus. There, the campus is a backdrop; here, the campus gives character and flavour to the stories,” he adds. Down The Road saw a lively launch at the Landmark bookstore in Nungambakkam recently, where four of the 16 authors — Vibha Batra, Malathi Jaikumar, Nikhil Ragagopalan and Ranjani Iyer, joined Ahmed, Bina Sujit, editor, Just For Women and P Madhavan, writer, composer and film producer in an engaging discussion. Vibha Batra is a city-based copywriter and her contribution, Loves me, love me not, “is a simple tale of a lovestruck boy, with a twist in the end.” A postgraduate of communication from the University of Madras, she describes herself as “a writer who strikes a chord with the reader — makes him smile, laugh, cry, think.” Malathi Jaikumar is one of the more seasoned writers of the lot, who has served as the chief sub-editor for a national daily, the deputy head of Press and Public Affairs, British High Commission and media and communication consultant for UNDP doing post Tsunami advocacy work. For her, “listening to, or watching the younger generation go through their school and college days, are all grist for the mill.” Of her own days, she remembers playing truant one day and not returning home till late evening, which “caused a lot of panic and some stern words on return.” Malathi has contributed two stories — Dare to Bare and The worm that turned, to the book. Nikhil Rajagopalan’s story, Just a Moment, is about two friends sharing the last few minutes of their college life — a moment frozen in time. With a bachelor’s degree in biotechnology from VIT University and a masters’ degree in bioscience from the University of Leeds, UK, the youngster describes his debut writing venture in Down the Road as a “time machine that takes us down memory lane.” Ranjani Iyer’s job as a dental practitioner is the motivation behind her story — Dimples and Cute Smiles. It is a riveting experience of a nervous young paediatric dentist on the first day of her Paedodontia Posing at the National Dental College, Chennai. A mother, practitioner and member of the Rotary Club, Ranjani says she compartmentalises her time. “I would write early in the morning and in the afternoon, after the morning session in the clinic,” she explains. With such diverse perspectives offered by writers of varying age-groups, Down The Road by Grey Oak Publishers, brings out stories from campuses across the country. “We would like the book to reach out to cross sections of society and help them look back on life and times in school and college. Also, we want the book to be a platform to launch new talent. 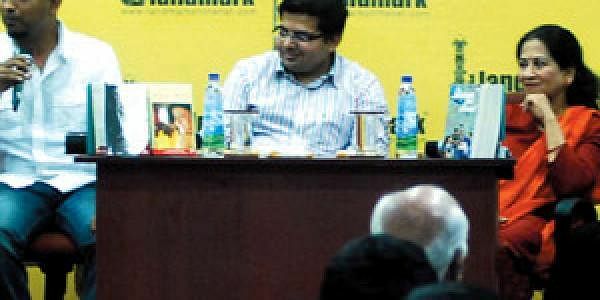 Five young writers make their publishing debut with this one,” says Ahmed, who himself has contributed nine stories to the book.